UPDATE: The former Days Inn then became the Colonial Beach Inn and is now River Edge Inn. 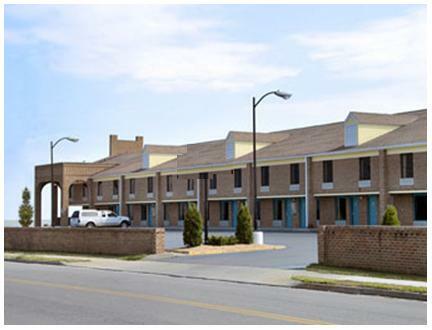 Under new ownership as of December 23rd, 2012 the hotel's rooms were remodeled beginning with the upstairs rooms. 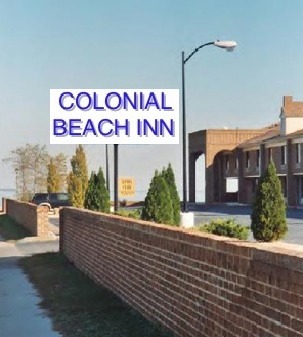 Okay, so the new Colonial Beach Inn sign isn't installed yet. I just wanted to picture what it would look like. Not to be confused with the Colonial Beach Inn in Santa Barbara, California (which changed its name a few years ago to "Lavender Inn By the Sea") the one I'm talking about is formerly known as the Days Inn, and sits on the former site of the old Colonial Beach Hotel. The grand hotel stood for a very long time and was finally dismantled in the mid-1980's. What has been built in it's place is a 2-story brick motel with 60 rooms, a pool, wireless internet, plenty of parking and more. Did I mention the awesome water views of the Potomac River? It's also right on the boardwalk and within easy walking distance to a Trolley stop, many various restaurants, and all sorts of great stores for shopping. They do accept pets, please be sure to contact them beforehand for their pet policy. The Colonial Beach Inn is under new management. This page will be updated with new information when it becomes available. The location is 30 Colonial Avenue. 804-410-2024 is the new phone number.